In our constant mission to help our members (and non-members) to improve their business & lifestyle, we often come across great articles and information. Here’s another! Feel free to tweet/share/enjoy! Does France now have a president with a genuine passion for wine? Both Macron and National Front rival Marine Le Pen tried to win winemaker votes during the presidential campaign. But, Macron has shown knowledge of France’s wine heritage. In the run-up to the election, French magazine Terre de Vins filmed a candid series of videos with newly elected French president Emmanuel Macron, in which he shows off his blind tasting skills and declares ‘wine is an ambassador’ for the country. In the blind tasting, Macron correctly identified a Bordeaux Blanc and a Côteaux d’Aix en Provence rosé. However, he did slip up slightly on the Château Pape-Clément 2005, which he mistakenly pinned as being from Pauillac, not Pessac-Léognan. In another video, Macron said that, ‘I was raised by my grandparents who had this formula: ‘Red wine is an antioxidant”. 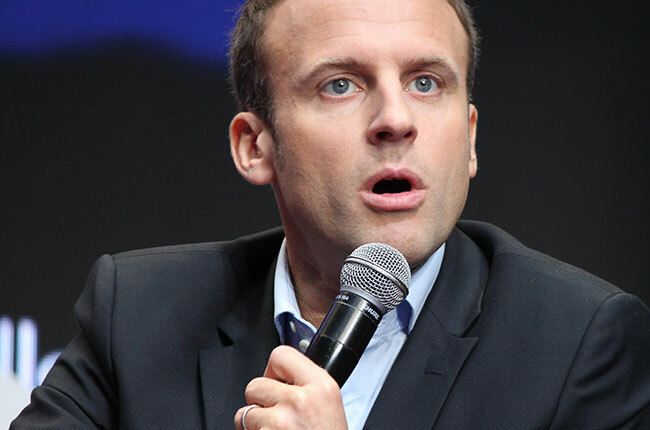 But, president Macron will need to work hard if he is to appeal to winemakers who voted for Le Pen, and to find favour with supporters and abstainers in an industry that has often complained of being un-loved in recent years. French parliamentary elections in June will be an interesting first test of confidence in him. What about other recent French presidents? François Hollande’s feelings about wine were less defined, although he did say that he enjoyed wine in his personal life. At the Elysées Palace, home to some 14,000 bottles for presidential consumption, cellarmaster Virginie Routis told Agence France Presse how she was given ‘carte blanche’ to choose whatever wines she liked for dinners and functions. There is also some confusing footage of the former French president appearing to make a fake toast with Barack Obama during his visit to the US in 2014. Hollande raised his glass, but seems to barely let the wine brush his lips before setting it down on a tray beside Obama, who asked if it was any good. Hollande squeezed the US president’s arm with an assuring ‘oui’ before turning away. Then again, Hollande did open Bordeaux’s Cité du Vin wine centre. Nicholas Sarkozy has probably caused the most displeasure to winemakers in the last couple of decades. He was known as a tee-totaller during his presidency and his clean-living pursuits were criticised as un-patriotic by some. ‘He could at least have the intelligence to take it in and spit it out,’ Vincent Charleux, a winemaker for Gerard Bertrand, told Reuters in 2007. Jacques Chirac might have been famous for building up a handsome cellar of fine wines during his time as Paris mayor, but he has been widely reported as preferring beer to wine. One diplomatic source told Decanter.com several years ago that Chirac only drank Beck’s at once official function, though other reports have claimed that he had a penchant for Corona. François Mitterrand, who was president from 1981 to 1995, was purportedly a fan of Bordeaux’s Château Haut-Marbuzet. His economic policies also proved popular with some producers. Decanter knows of one winemaker in Languedoc-Roussillon who used to refer to her home swimming pool as the ‘Mitterrand pool’, explaining how his government’s financial aid had helped her to build it. © 2019 Troly Business Systems ACN 167 332 167. Troly is a Registered Trademark.